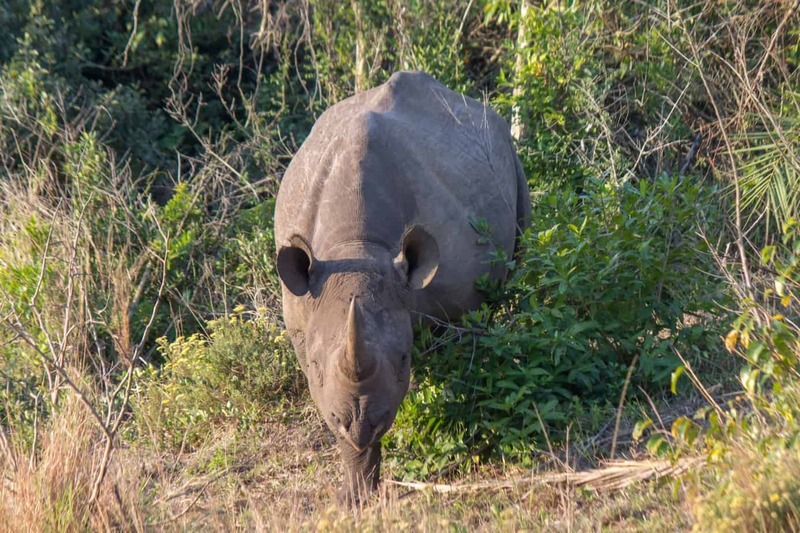 The black rhinoceros, or hook-lipped rhinoceros (Diceros bicornis), is the smaller of two species of rhinoceros in Africa, the other being the white rhinoceros, or square-lipped rhinoceros (Ceratotherium simum). The black rhinoceros is actually not black in coloration, and all species of rhinoceros are normally greyish in color. The name comes from the misinterpretation of the Dutch word used to describe the white rhinoceros, “wijd”, which means “wide” and describes the wide lip of the white rhinoceros. The word “wijd” was interpreted by the British to mean “white”, and the black rhinoceros, being the other rhinoceros species, was then simply referred to as black. 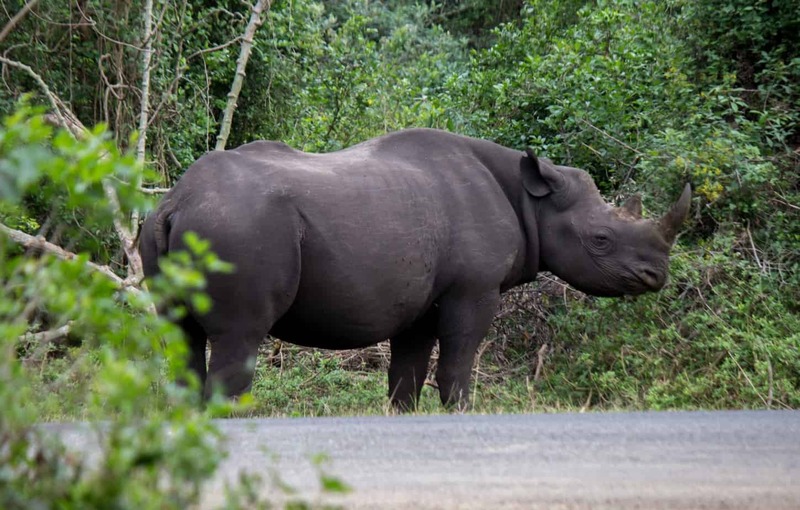 Hook-lipped rhinoceros is a more descriptive name for the species, and makes it easier to distinguish between the two species of African rhinoceros. An adult black rhinoceros will get to a height of 132-180 cm (52-72 in) at the shoulder, and can reach lengths of 3.8 m (12.5 feet). Males are typically larger than females and a normal weight for an adult is between 800-1,400 kg (1,800-3,100 lb), though unusually large males have reached twice that size. Both sexes have two horns growing from their skull, which are made of keratin, the same as our hair and fingernails. The front horn is typically larger, though some specimens have exceptionally large second horns. Average horn length is 50 cm (20 in), but there are records of horns up 140 cm (55 in). The black rhinoceros is generally a solitary animal, except when females have calves. Young adults will sometimes seek out older individuals upon reaching independence. 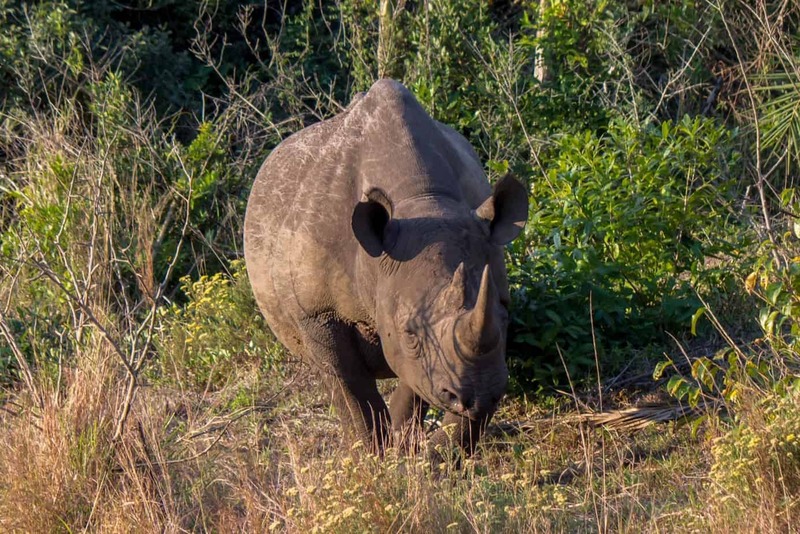 They have home ranges that change in size depending on available resources, but they are not very territorial and they commonly share a range with other rhinoceroses. 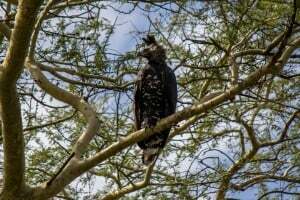 They are browsers, which means they will feed on leaves, branches, bushes and fruit and will use their prehensile hooked-lip to grab the food while feeding. 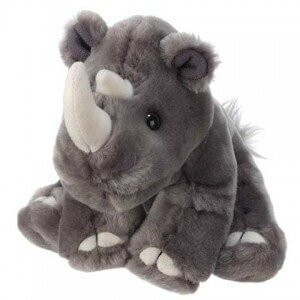 They are very shy animals and are noticeably rarer than their larger cousin, the white rhinoceros. 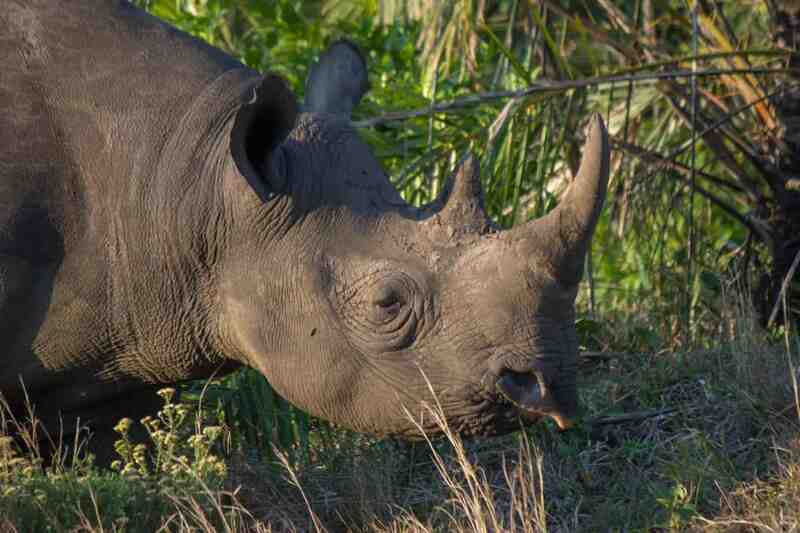 This is mostly due to the fact that black rhinoceroses tend to prefer thick bush, shrubland and dense woodlands. Their thick skin protects them against these often quite thorny habitats. 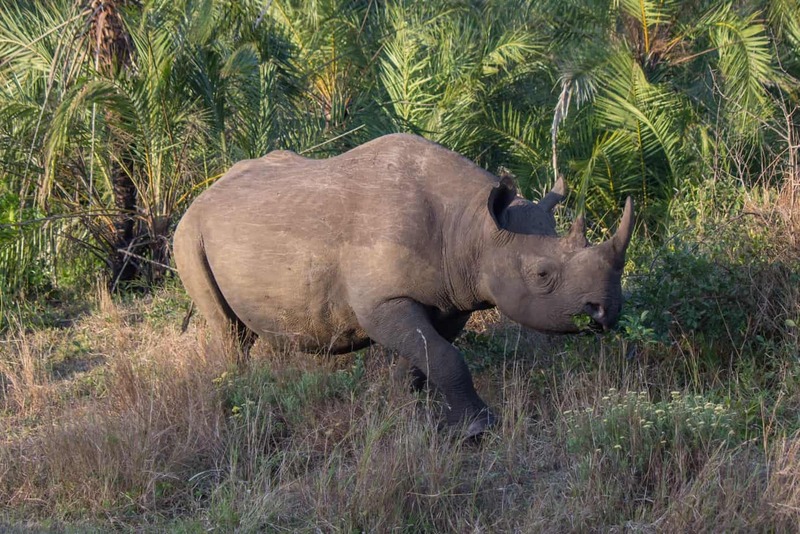 The eyesight of the black rhinoceros is poor, but it makes up for the lack of vision with exceptional smell and hearing, with ears that can independently rotate in all directions. It is known to be highly nervous and aggressive, and will charge towards anything it perceives as a threat. Even trees and termite mounds have fallen victims to the aggressiveness of a black rhinoceros. Many regard it as the most dangerous animal in the African bush because of this, but coming across one on foot is quite rare. 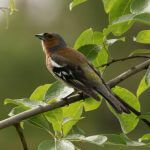 If you by any chance come across one, the best thing to do is normally to climb a tree, hide behind something large or throw something towards it to divert its attention. They have also been known to charge vehicles, but will most often flee when approached by a car. Because of their solitary lives, males only know if a female is ready to mate by smelling her dung and urine. Dung is often deposited in special areas called middens, which are shared by all rhinoceroses in the area, even white rhinoceroses. This makes it possbile for rhinoceroses to communciate with each other and to know which other individuals are present in the area. When a female ready to mate is found, a male might have to fend off other males through sparring. If he wins he will stay with the female for a few days to a few weeks, while copulating several times as day. The gestation period is 15-16 months, and after a calf is born it will stay with its mother for 2-3 years, until she gets a second calf. Sexual maturity is reached at the age of 5-7 for females and 7-8 for males. In undisturbed habitats a black rhinoceros can live to become 35-50 years old. 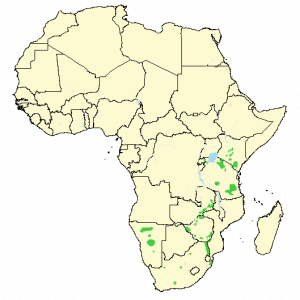 The black rhinoceros used to be the most common species of rhinoceros, with probably several hundred thousand individuals on continental Africa around the year 1900. 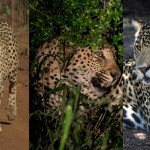 During the 20th century the numbers drastically dropped due to hunting and poaching, and in 2008, only 4,200 individuals were left, although this was an increase from an expected 2,400 indivduals from four years prior. 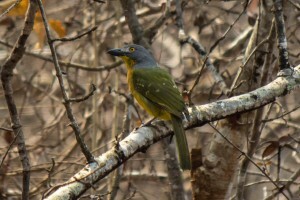 It is now listed as critically endangered on IUCN Red List and is still facing the great threat of poaching. 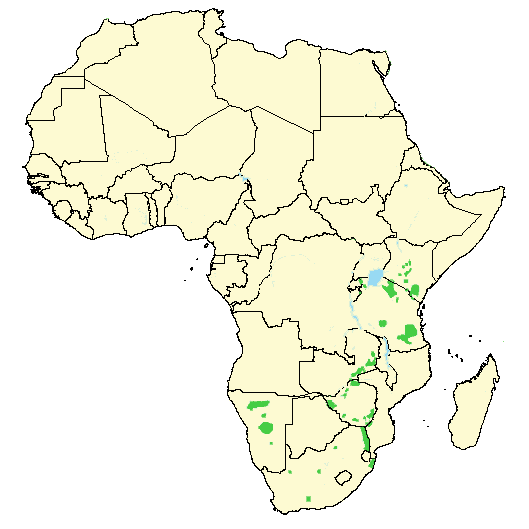 The Western black rhinoceros (D. bicornis longipes) was declared extinct in 2011, and the population in Mozambique is possibly extinct as well. Poaching is without a doubt the biggest theat at the moment, with a huge increase in demand in China and Vietnam for rhino horn. It is still used for traditional medicine, though no effect has ever been proven. In the Middle East it is also used to create traditional daggers, which are seen as status symbols, and that was a major reason for the population demise in the 1970’s. Although any trade in rhino horn is illegal, there are people secretly supporting this industry in all levels of society. Protecting them is even harder when the people set to protect them are involved themselves. 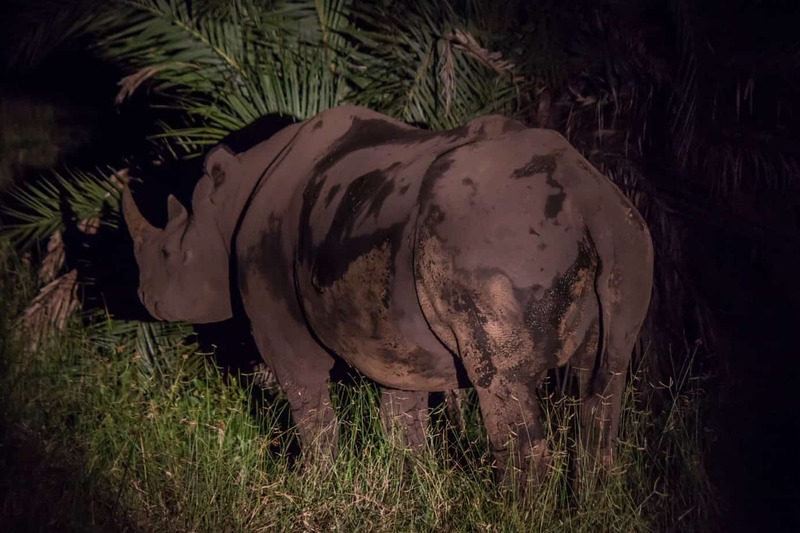 If the trend continues, the future looks bleak for the black rhinoceros, though there might be hope that their shy nature will keep them alive for a while longer until we get an end to the problem. 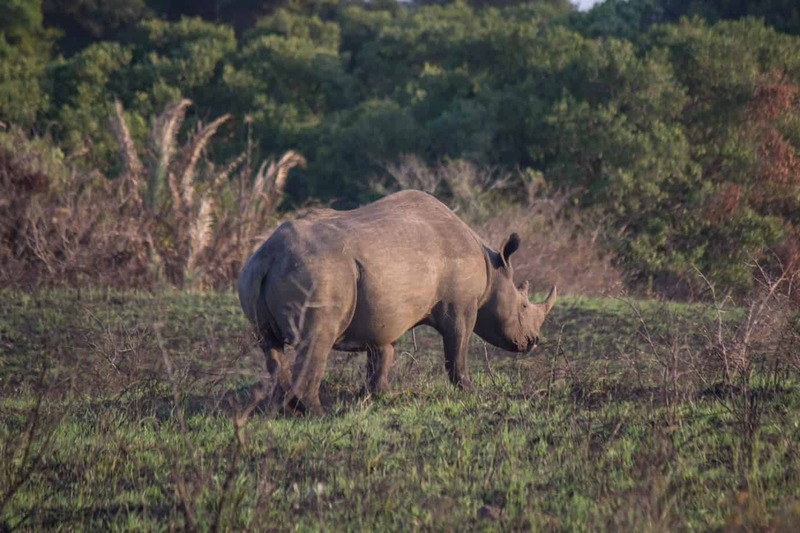 As of now, the white rhinoceros is definitely taking up the bulk of the victims, as they are more numerous and visible, and that could be the saving grace for the black rhinoceros. 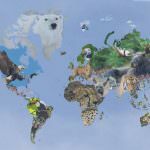 Still, we need to find a solution fast if we want to save any species of rhinoceros. Such is the situation as it stands today. 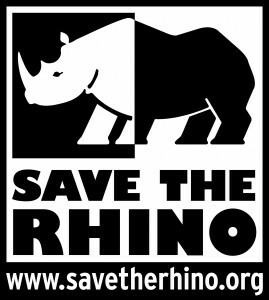 Mission: To increase the numbers and growth rate of the black rhino.